How to choose a hydroelectric turbine, a specific speed question! The two main data needed to design a turbine are the maximum flow rate and the net head associated to this flow. However, these two values do not allow to uniquely define the type of turbine that must be designed; the designer is required to choose a third fundamental parameter: the number of revolutions. Then it will be possible to define what we call the turbine specific speed. But what is the specific speed? Leaving aside the theory about mechanical similarities, let's briefly explain what it is. This parameter relates to each other the characteristic data of the turbine, and has the peculiarity of identifying families of geometrically similar machines (and then to scale them), having very different powers and sizes, but with one fundamental common characteristic: they are part of the only family of turbines that can process the available head and the discharge with the highest performance possible. With simple calculations you can use the characteristic data of the turbine (H, Q and n) to find a value of specific speed that uniquely identifies the most efficient type of turbine and its main dimensions. All this thanks to the experience gained in the design of more than a century of hydropower construction and excellent theoretical studies that have enabled the development of the theory of similarity at the basis of the specific speed calculations. This does not mean that all turbines manufacturers build the same equipment once given the same typical number. After choosing the type of turbine and the main dimensions defined, each manufacturer has developed its own geometry and parameters that differentiate the turbines in terms of operation, reliability, cost and efficiency. Over the years, various design schools have proposed many definitions of the specific speed. The UNI-ISO has tried to standardize them into a single parameter, but in fact the definitions remain different. In the picture, every value of typical number of machine k (or nq) corresponds to a very specific type of turbine, exception made for some overlapping areas in which there is no univocal choice and the experience has shown that they can adapt well to different types of turbines (Pelton / Francis and Francis / Kaplan). The question that arises is: how is this value really used? Known the head and discharge, a preliminary study is made to define the appropriate number of revolution, taking into account some possible rotation speeds, and then calculating the relative specific speed which corresponds to a well-defined design solution. The possible solutions are then compared, in terms of performance, cavitation behaviour, main dimensions, etc. and finally the choice is made for the solution that best suits the specific project. 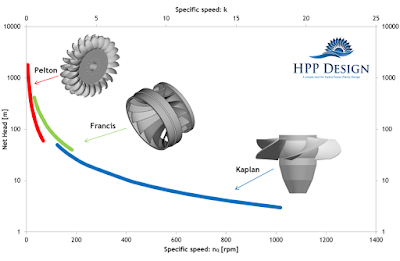 Once the rotation speed is fixed, starting from the specific speed it is possible to choose the type of turbine and start the detailed design. Hpp-design is the tool that helps the designer to make a preliminary choice by comparing these elements directly into the chosen page. Try it out! For information contact us here or send us an email here, you can also read the FAQs. Hpp-design is constantly updating and I recommend you to register to our newsletter here to keep up to date on new releases.